We are happy to inform our patients, that after much preparation La Porta Dental have now confirmed a cooperation and excellent working relationship with Southgate Dental Clinic, in Southgate Shopping Centre, Dublin Road, Drogheda, Co Louth, Ireland. Our goal, having more than fifteen years’ experience dealing with patients in Hungary, is to extend our services in Ireland and make them more easily reachable for the Irish patients. La Porta Dental agency’s mission is putting patients, who do not wish to travel to Hungary in touch with a Dental Clinic whom we have thoroughly vetted and researched. Having previously worked with Dr. Antal Roka in Hungary we are very confident that any and all patients treated in this care will be more than happy with the service, staff & prices available. The dental team at Southgate Dental have exceptional dental knowledge and experience, they are all registered members of the Irish dental council and the clinic is modern, clean and well designed. The clinic was designed in 120 square meters and has 3 separated dental surgeries, an onsite digital X- Ray and CT-Scan (3D Imaging) for quick and comprehensive treatment planning. 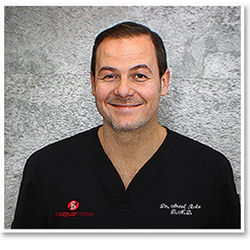 Dr. Antal Roka, is the principle dentist and owner of the clinic. He is registered with the Irish Dental Council as a general dentist, but also as a Specialist Oral Surgeon. Dr. Roka has been living in Ireland for many years and has been treating patients nationwide, with excellent results and aesthetics. Wisdom tooth extractions, Dental Implants, Sinus Lift, Bone Augmentation. Zirconium Crowns, Porcelain fused to Metal Crowns, Porcelain Veneers. Partial and Full Dentures, Acrylic Dentures, Chrome Cobalt Dentures. The clinics aim is to build a friendly, professional and accessible dental clinic. One in which the patients can feel both calm and reassured. With flexibility, customer care, accessible facilities and well established experienced dental professionals. At La Porta Dental we feel that we can refer patients to Southgate Dental Clinic for unrivalled dental treatments, with prices that the wont upset the bank manager and which don’t require booking flights and travelling abroad. We believe that dental care should not be a financial matter only. However we understand that many people who want to look after their teeth and smile, are just not financially in a position to do so. Patients are aware about the possibility of having dental treatment abroad for a fraction of the cost, but may not feel comfortable travelling and having extensive work carried out while being away from home. With this in mind La Porta Dental would like to help patients with this alternative and with prices that we know are extremely competitive in Ireland. Tooth replacement, complete dentures on dental implants, aftercare and much more … Is now available for you in Drogheda, Ireland, with free parking only 30mins drive from Dublin and 1hr from Belfast. Seize the opportunity, you can now avail of a complementary Initial consultation (excluding X-Ray) from this experienced, high quality, professional clinic and Enjoy Your Smile! Contact us today to arrange a suitable appointment! We offer healthy smiles & dental implants!